Each and every animal should be in pristine, beautiful coated condition, constantly. It’s certainly rougher when you have some sick kittens, but still they need to be perfectly clean as soon as you are done with them. 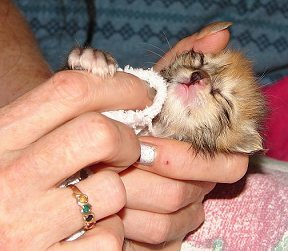 The criteria should be: Can you kiss the kitten/cat over its entire body and not gag? That seems silly (and I'm certainly not going to ask you to actually do this!) but it forces you to take a good hard look and find the messes stuck in the fur. There are several crucial health concerns that need to be addressed. Cats and kittens both groom themselves and each other. If feces, old food or mucous is stuck in the hair, the animal could ingest them and fall ill.
Guck on the fur can irritate the skin and make it much more susceptible to ringworm infection, let alone making the kitten feel very uncomfortable. We all know how we feel if we’re dirty and grungy. Certainly cats/kittens seem to feel the same way. Just as we would want any human baby immaculately clean at all times, we want our kittens the same way. And, let’s face it. Who wants to cuddle and love up a dirty kitty. They’ve got to be clean so we can safely snuggle ‘em up!! Brushing: Cats naturally groom themselves and can take offense when you try to help them. Here´s a grooming tip on how to get your kitten comfortable with regular grooming - Purchase two identical brushes. Start brushing your kitten with one of the brushes, when she reaches around and grabs that brush, let her have it. Then pick up the second brush and continue brushing. Whenever she grabs the brush you are using, just pick up the other one and continue brushing. Eventually, your kitty will learn that you are not hurting her, and that grooming actually feels good. Bathing: Start bathing kittens early! Cats aren't really afraid of the water, but the noise running water makes! Once startled they learn to fear it. Start the first day you have the kitten. Dunk her feet into very shallow, very warm water. Leave the tap water running, so she gets used to the sound. Then immediately dry her feet and give her a special treat or bottle and attention. Do this for another day or 2 and then set her down in the water and let her stand in it for a few seconds, then pull her out and dry her feet always followed by the treat. Towards the end of the second week, you should be able to completely wash her, even under running tab water. All my kittens, without exception purr after they got a bath. Keep everything, water, soap, etc, out of her eyes and off her face. This will cause panic, and could irritate her eyes and most important, will scare her for good.